Dr Gav Scneider is an acknowledged leader in the field of human based risk management and the psychology of risk. He is a serial entrepreneur and has been running his own businesses since 2001. He has conducted business in over 17 countries and provided a wide range of services for a very diverse client base ranging from heads of state to school teachers. He is a leading academic and subject matter expert in his field and is a much-sought after International speaker. He has trained thousands of people in his own right and to date, his companies have trained in excess of 150,000 people in numerous countries. he holds numerous trainer, educational and coaching qualifications, has been a martial arts full contact champion, is a 7th degree black belt and has been an Instructor to Royalty Protection teams, Presidential Protection teams and Military and Police Special Units. Dr Gav is also the author of the bestselling book Can I See your Hands: A Guide To Situational Awareness, Personal Risk Management, Resilience and Security. 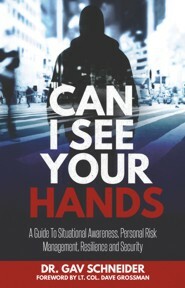 The title of this book, “Can I See your Hands” refers to one of the key outcomes of this book– being able to tell whether or not people want to cause us harm. To put it very simply, if you can see someone’s hands and they are not concealing them, holding a weapon or positioning to strike you, one’s levels of trust and confidence can increase. This simple example can serve as a reminder to all of us in many of the complex moments we have to deal with, and difficult decisions we have to make, in everyday life.